Coordinator of the Equity and Access office Lauren Copeland-Glenn and assistant professor of educational specialties Chris Lanterman presented “The Accessibility Scavenger Hunt: Empowering Students to Advocate for Campus Change” at the 2018 Association on Higher Education and Disability (AHEAD) Conference in Albuquerque, New Mexico. The presentation highlighted the collaborative efforts of the student organization, NAU 4 All, and the university’s Commission on Disability Access and Design in creating an accessible campus and institutional culture that embraces accessibility and universal design. The Academy of Legal Studies in Business (ALSB) voted Eric D. Yordy president-elect and conference chair of the 2019 summit in Montreal. ALSB is an international association for teachers in business and law working outside of professional law schools. Yordy is associate professor and interim executive director of the School of Hotel and Restaurant Management at NAU. Larry Stevens and Chad Woodruff of the Department of Psychological Sciences authored “The Neuroscience of Empathy, Compassion, and Self-Compassion.” The book focuses on the current research, future research and societal conversation regarding the science behind empathy, compassion and self-compassion. A group of students, faculty and staff who are part of the NAU Study Abroad program were chosen to present at the Lessons from Abroad Southwest Conference on Sept. 22 at the University of Arizona. The conference is designed to ease the transition of recently returned study abroad students back into their home cultures and allow the opportunity to share experiences while networking with an international community. Christina Thomas and David Trilling were co-authors on “Solar system science with the Wide-Field InfraRed Survey Telescope (WFIRST).” The paper details a community-led assessment of the NASA space telescope’s ability to explore solar systems. David Trilling, Andrew McNeill and Michael Mommert were co-authors on “Taxonomy and Light-curve Data of 1000 Serendipitously Observed Main-belt Asteroids.” The authors explain the findings from a study of main-belt asteroids observed using the Sutherland, South Africa, node of the Korea Microlensing Telescope Network. Juan P. Tolento and Tyler Robinson co-authored “A Simple Model for Radiative and Convective Fluxes in Planetary Atmospheres.” The paper outlines a model of shortwave and longwave radiative transport and proves its effectiveness in providing important information in planetary atmosphere research. Mark Salvatore and Christopher Edwards were co-authors on “A Complex Fluviolacustrine Environment on Early Mars and Its Astrobiological Potentials.” The paper examines the unusual coexistence of certain minerals in parts of Mars and the information this can produce about the geochemistry, water activity and climate of the planet’s early days. Étude O’Neel-Judy, Dylan Nicholls, John Castañeda and John G. Gibbs co-authored “Light-Activated, Multi-Semiconductor Hybrid Microswimmers.” O’Neel-Judy, who graduated with a degree in physics in May, was the lead author on the paper discussing modes of motion in photoactivated microswimmers made from titanium dioxide and cuprous oxide. With the start of the new school year at Northern Arizona University comes the start of the 2018-19 President’s University Leadership Program, bringing together university staff and faculty from all levels to learn about the future of leadership in higher education and supporting members’ pursuits of opportunities in the field. The program kicks-off in September with a two-day retreat at The Hilton Squaw Peak Resort in Phoenix, with subsequent sessions held once a month on campus October through May. Throughout the program, participants will gain better leadership skills and understanding of the Arizona university system. Topics receiving special focus in Arizona context include the purpose and functions of major university departments, decision-making processes throughout the university, the importance of an institutional message and strategic planning and budgeting that benefits each department as well as the university as a whole. This fall’s group will be the seventh class at NAU. NAU-TV received three nominations for the Rocky Mountains Emmy Awards, which take place on Sept. 22. The feature, “I Recommend You Start Painting” is nominated for News Singles Story/Series/Feature and for Photographer (Non-News). The promotional spot for NAU-TV, “The Lumberjack Life” is nominated for Promotion Program- Single Spot or Image. Jerry Anderfuren, Josh Biggs, Corderro McMurry, Erik Sather and Alex Thomas all were named in the nominations. Professor emeritus Matt A. Casado presented a paper at the Annual Research Conference at Bournemouth University. The paper, “A Model for Career-Specific Foreign Language Teaching in Higher Education Professional Programs,” proposed standards for teaching industry-related foreign language courses at the university level. Casado represented The W. A. Franke College of Business. School of Forestry professor Thomas Kolb presented a talk at the Gordon Research Conference on Plasticity. The talk Kolb presented was, “Forest CSI: Understanding Mechanisms of Tree Mortality from Vascular ‘Fingerprints.’” The conference focused on phenotypic plasticity in plants. Emeritus professor Laura Huenneke was elected president of the Ecological Society of America (ESA) during the society’s annual meeting. ESA is one of the world’s largest professional societies of ecologists, with more than 9,000 members. As president, Huenneke will chair ESA’s governing board that establishes the society’s visions, goals and objectives. Personalized Learning program coordinator Corrine Gordon was selected to serve on the Board of Directors for Competency-Based Education Network (C-BEN). C-BEN is a group of universities collaborating to address shared challenges in design, developing and scaling competency-based degree programs. As NAU prepares to welcome back the Lumberjacks, including the class of 2022, there are a few things to know that will make navigating campus easier for faculty, staff, students and their parents during move-in week. Northern Arizona University students living on campus are scheduled to move in 8 a.m. to 5 p.m. Tuesday, Aug. 21, to Friday, Aug. 24, with most of the activity scheduled for Thursday and Friday. During this time, a modified traffic plan will go into effect to accommodate the increase and unloading of vehicles. NAU employees should be aware of the following road closures: Beaver Street Transit Way (bus spine) southbound from McCreary Drive and University Drive will be closed to non-move-in traffic to facilitate residents moving into central campus halls. NAIPTA bus routes have been rerouted to accommodate these closures. McConnell Drive and Pine Knoll Drive will be open for east-west travel. Please allow extra time when commuting to and from campus these days. For real-time traffic and logistical updates, follow NAU on Twitter using #NAUmovein. 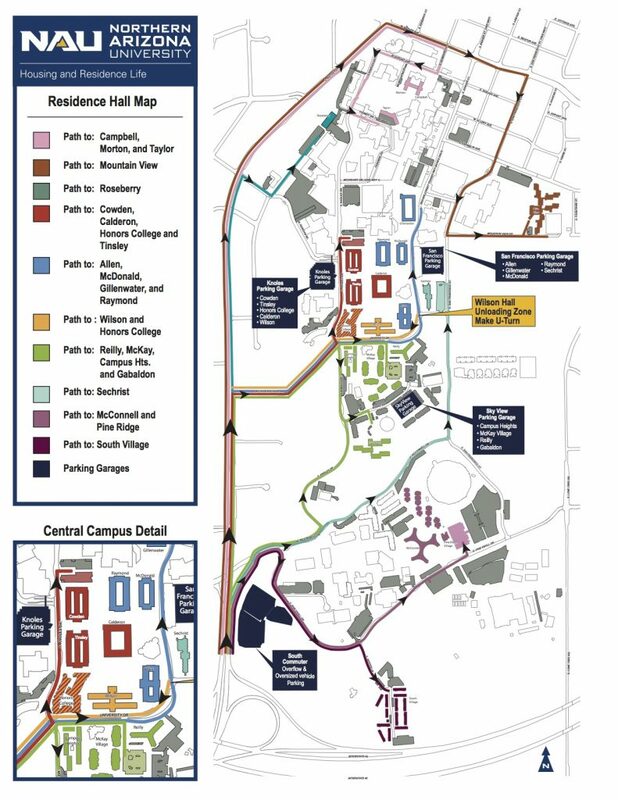 Directions and a map sent to parents to help them navigate campus can be found online. From Thursday, Aug. 16, through Friday, Aug.24, southbound Interstate 17 will close from 8 p.m. to 5 a.m. where the highway passes under Interstate 40. To head south out of Flagstaff, drivers will need to take I-40 west to the Flagstaff Ranch Road exit and then use I-40 eastbound to the exit for southbound I-17. Also, I-40 is narrowed to one lane in each direction through the interchange. The closure is part of the project removing the I-40 bridge decks. Learn more about the project at the ADOT website. For real-time highway conditions statewide, visit ADOT’s Traveler Information Website or follow ADOT on Twitter. Do you have a spotlight to share with the NAU community? E-mail your announcements to Inside@nau.edu or use our online submission form. John Drumm, class of 1986, published the children’s book “Smart Cinderella: The Smart Princess Series Book 1.” The story is a retelling of the classic fairytale with a modern message of empowerment, action and intelligence for young princesses. Joanna Gick, who earned a bachelor of arts in 2004, is one of eight contestants on the NBC competitive crafting show “Making It,” hosted by Amy Poehler and Nick Offerman. The show premiered this week and will continue throughout the summer. Gick co-owns the Scottsdale-based interior design company J & J Design Group. The International Association of Women (IAW) recognized Paula Burnstein as a 2018-19 Influencer of the Year. Burnstein received the honor for her leadership in entrepreneurship and commitment to her profession. Burnstein runs her own law firm in the Phoenix area and is personally involved in each case the firm handles. Burnstein earned her master’s in education in counseling from NAU. Katelyn Seabury, 2009 graduate from the School of Communication, won a Knight News Innovation Fellowship from the Tow Center for Digital Journalism at Columbia University. Seabury’s project research focuses on smart speakers and news consumption.